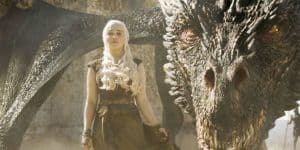 Game of Thrones Season 8 Will Have 6 Episodes | Nerd Much? We haven’t even been given the first episode of Game of Thrones‘ upcoming seventh season yet, and already, we’re getting a little bit of information about season 8, the series’ final season. At the SXSW Film Festival in Austin showrunners David Benioff and Dan Weiss confirmed that Game of Thrones Season 8 will only have six episodes. “It’s only going to be six episodes for the final season,” Benioff said during a featured speaker panel at the South by Southwest Film Festival in Austin, Texas. HBO hasn’t made the official announcement just yet, and we’ve already been told that both Season 7 and Season 8 will be shorter than usual. Now, we have semi-confirmation from the showrunners, themselves, that their 73-hour tale will end with a final six-episode run for Season 8. While it’s commendable that HBO and the showrunners don’t want to try to stretch this cash cow out for three or four more seasons, it’s super depressing that the end is in sight. Here’s to hoping we see Arya get her revenge on Cersei as the very last moment of the series. What do you think of the GoT’s shorter final seasons? For more of the latest Game of Thrones news, stay tuned to NM.